The truth is that most bonuses will have wagering requirements attached to them which mean that players have to wager the bonus amount many times over before they would be able to withdraw any winnings. For example, let's say we have a £100 bonus with a 50X wagering requirement. In order to withdraw any winnings you'd won off the bonus, you would have to wager over £5,000 (£100 x 50) before being able to withdraw those winnings. Not quite so appealing now is it? Imagine you had won £1,000, £2,000 or even £5,000 off that bonus, only to realise you'd have to carry on playing and risk losing it all just to be able to withdraw it. Many players refuse to accept any bonuses for that very reason - they prefer to use their own cash to play so at least if they do win, there are no surprises when it comes to cashing out. It's worth keeping in mind though, that wagering £5,000 doesn't necessarily mean losing £5,000, and in virtually all cases, players do wager many many more times than they lose. Take slots for example - most slots pay out every few spins, and often have payout percentages (RTP) of around 95% (the other 5% being the house edge). What that means is that theoretically, the slot game pays out £95 for every £100 wagered on it. On that (theoretical) basis therefore, if a player were to wager £5,000 on a slot game then they could expect to receive £4,750 in winnings over the duration of their play. On the flip side, if a player loses £100 over the duration of play on the slot game, they have theoretically wagered £2,000 on it during that period (£100 / 5% = £2,000). In the past, some players realised that if they played games with a low house edge such as Blackjack (0.05%) or Roulette (2.7%) then they could fulfil the wagering requirements without losing very much. Furthermore, they realised they could place £10 bets on both red and black on Roulette, spin the wheel, and as long as zero didn't come up then they would come out even money, but would still have wagered £20 towards their wagering requirement. However, casinos soon caught on to this tactic and introduced further wagering conditions which stipulated that not all games contribute the same towards wagering requirements. 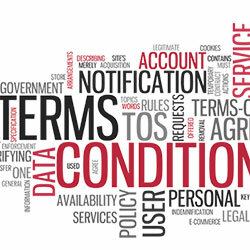 The result is even more confusing terms and conditions associated with bonuses, which most players find baffling, or worst still, are completely unaware of. Free spins in most cases also have wagering requirements attached to them. But as there is no monetary bonus, the wagering requirement is applied to any winnings won from the free spins. For example, if we have some free spins with a 50X wagering requirement, then any winnings would have to be wagered 50 times over before they could be withdrawn. That would be quite a shock to a player who's just landed the top prize! For this reason, free spin wagering requirements are arguably the harshest, and in most cases, the most barbaric of wagering requirements, especially when they are upwards of 30X or 40X. They effectively make the free spins worthless, and certainly nothing more than "demo credits" to try out one or more games. So, what does this mean for the player? Well, bonuses and free spins are a great way to try out new games or get a feel of a new online casino. Essentially though, when the wagering requirements are so harsh it makes it virtually impossible to win anything, then the bonuses should probably only be treated as demo credits. Wagering requirements in their own right are justified, but they also need to be fair and in any case made clear and transparent to the player. Otherwise they are nothing more than an attractive, and deceptive offer, to tempt the player into signing up. A 50X wagering requirement makes it virtually impossible for a player to win anything, whereas a 10X, 20X or even 30X wagering requirement is more fair and feasible to fulfil. Bonuses free from wagering requirements do exist (we're dedicated to them!). Check out our comprehensive list of casino bonuses with no wagering requirements - we've search the web high and low to bring you the best no wagering bonuses and free spins so you can play in confidence that anything you win off the bonus or free spins is yours to keep. Be mindful that all bonuses have terms and conditions associated with them, and so you should still pay particular attention to any significant terms or exclusions. The most common ones to look out for are maximum win amounts, minimum withdrawal amounts, and applicable games - as some wager-free bonuses are only valid on particular games. Wagering requirements on free spins are perhaps the most difficult to come to terms with. As they usually apply to winnings, the total amount a player would have to wager to fulfil the requirements can be many more times the value of the free spins, depending on how much was won. Thankfully there are plenty of casinos offering wager free spins, both as part of their welcome offers and ongoing promotions or loyalty rewards. Bonuses with low wagering requirements sometimes offer better value than wager-free bonuses as the casino can afford to give away a larger bonus or more free spins. We accept that wagering requirements are often necessary to prevent abuse and so we also recommend a number of low wagering casinos which we feel offer good value whilst acting fairly to players.